S.O.S. 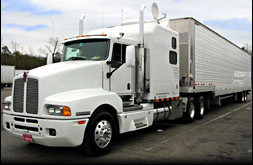 Transportation, LLC is an experienced full service theatrical trucking company. Our goal is to consistently provide quality service and good value on each job we are awarded. At S.O.S Transportation, LLC we understand the unforgiving deadlines and needs of the entertainment industry. Our focus is to transport, deliver and protect your equipment according to your specific schedules, needs and priorities. S.O.S. Transportation, LLC's staff are dedicated, thorough, organized and professional. while overseeing and coordinating all of your trucking needs 24 hours a day, 7 days a week. S.O.S. Transportation, LLC provides an efficient and helpful support system for our drivers so that they can stay focused on serving you, and you can stay focused on your production. S.O.S. Transportation, LLC's drivers are well-trained and experienced industry professionals and each driver is screened and rigorously tested for safety and reliability. All S.O.S. Transportation, LLC drivers are experienced, consistent and dependable industry professionals who focus on the efficiency and safety of your equipment's transportation. Our lead drivers work with your production crew to ensure fast and smooth load-ins and load-outs. To learn more about S.O.S. Drivers click HERE. Interested in becoming a driver for S.O.S. Transportation? Fill out our online application HERE. © Copyright 2002-2018 - S.O.S. Transportation, LLC and sostransportation.com. All Rights Reserved.